The recent release of “The Hunger Games” movie has brought in $155 million during its box-office opening, making it the third highest opening-weekend earner ever (and grossing domestically $302 million to date). So what is it about this movie that has got people queuing up en masse to see it? Well, it’s got something that quite a few other successful and not-so-successful movies have: A story line that has people hooked. It’s one that centers around a dystopian future, where people are forced to set upon each other in violent and fatal battles for entertainment value. There was a time, of course, when this type of thing was actually part of a nation’s culture: some 2000 years ago in the era of the Roman Gladiators and the infamous battles to the death in the amphitheaters spread across the Empire. Futuristic battles to the death, set in a post-apocalyptic or de-sensitized world, where a dystopian society regards brutal and murderous violence on television as normal entertainment, have often made for pretty good movies, so it’s no surprise that “The Hunger Games” has done so well. Let’s take a look at some of the other movies that fit the same bill. 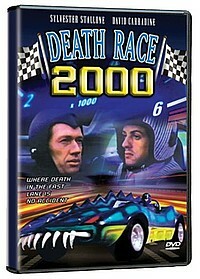 Going all the way back to 1975, “Death Race 2000” has become a cult film, and there has even been a remake of the original, which was released in 2008. One of the first films of this genre, in the world of “Death Race 2000” the U.S. has become a fascist police state, the result of a military coup and a financial crisis. The Annual Transcontinental Road Race is the state-controlled entertainment for the public, a race where killing your opponents and any pedestrians that get in the way is rewarded with more points. The same year another film of a similar vein was released, “Rollerball.” In the universe of Rollerball, the world is governed by a corporate state, which controls absolutely everything, from energy and food, to transport. The governing corporation have put in place a violent sport called Rollerball, which replaces all other sports. The matches are televised, with death and injury common sights for the viewers. One of the most popular movies that involved a televised death match is the 1987 movie “The Running Man.” Starring Arnold Schwarzenegger as Ben Richards, it is set in an American totalitarian state where convicts are given a supposed chance at freedom in a fixed televised game show. Ben is wrongly convicted and forced to fight for his life in a murderous gladiator style game show. Battle Royale: a little too similar? In 2000, the Japanese movie “Battle Royale” was released. Also based on a novel, this movie has one big theme similar to “The Hunger Games” in that children — not adults — are forced to compete in the deadly games. In the world of Battle Royale, children are kidnapped and forced to fight to the death against each other. The groups are given various types of weapons and fitted with a collar that will explode it they don’t comply with the rules. There has been some criticism towards the author of “The Hunger Games,” Suzanne Collins, over the similarity, although she claims to have never of heard of Battle Royale before she wrote her book. In the last few years, there have been a number of movies that fit into the same mold as “The Hunger Games.” 2007 saw the release of “The Condemned,” a movie where prisoners from around the world are purchased and forced to fight each other to the death in order to win back their freedom. The 2009 movie “Gamer” offers a different take on the death match idea. Instead on being of a television show, the death match takes place within an interactive game controlled by the public, and all the people in the deadly game are real people under somebody else’s control. It seems there is no let-up in the amount of movies that use this ancient desire for blood, just like back in the days of the Roman Empire. In fact, the author of “The Hunger Games” has already written two more books that follow on from her first. The follow-on novel to “The Hunger Games,” called “Catching Fire,” is already being made into a movie, and is due to be released in November next year. Are the days of 35mm film numbered? Recent moves by the major Hollywood (and foreign) studios don’t augur well for the format. While it takes thousands of dollars to duplicate a 35mm print and disseminate several thousand copies to movie theaters around the U.S., a digital copy of that 35mm print can be made for about $200 and then shipped on a hard drive (or, soon, by satellite or cable) to theaters, saving the studios millions of dollars every year. That’s great for the studios’ bottom lines, and they’re pretty much forcing America’s theater-owners to convert to digital projectors by threatening the elimination of film and by offering monetary incentives to defray the cost of conversion. The problem is that digital “prints” are great for DVD and home entertainment, but should never be used for big-screen, theatrical presentations. There is a warmth, fluidity and depth to 35mm film that digital can never replicate. (See Jerry Mander’s “Four Arguments for the Elimination of Television,” which details the physical and psychological differences between watching a continuous image on film and an image broken up into dots and bits on digital). Worse, the change to digital will lock-out the few remaining small theater-owners and art-houses, who won’t be able to get 35mm prints of classic films — and, even if they wanted to, they couldn’t afford the digital changeover. What to do? Check out the following sites (Fight for 35mm, Row Three, Movieline) that discuss the issue, then sign the “Fight for 35mm” Petition. Please. Now. Home video has – in a similar manner to cinema in general – had an incredibly rich and varied past – this we all know. The quality of the picture, the actors, the themes, the sounds: it all changes over time. Even the formats with which we view any home media have changed, with different home video vessels coming and going over the years. We might well be on DVD and Blu-ray these days, but we haven’t always had it so easy and in such high definition. Like home video entertainment itself, home video storage/playback technology has come in leaps and bounds since the early days (whenever one might class those as, but that is a whole other kettle of fish). So sit back in your reclining rocker or favorite comfortable chair and let us take a brief look at just what has brought us to the current home video technology that we use today. It would be rather untoward to start with anything else, especially considering how the very term “home video” was coined from the extensive use of VHS tapes to drive the medium forward. 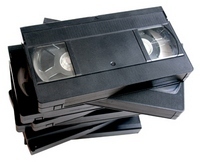 VHS (or Video Home System) was a major player in the television industry from way back in the 1970s right up until the late 90s/start of 2000, when DVD replaced VHS as the home video format of choice. VHS was developed by JVC (Victor Company of Japan) and was immediately at the forefront of the videotape format wars of the time, being JVC’s answer to Sony’s Betamax videocassette tape (more on which later). Eventually, VHS would win the “war” and emerge triumphant as the staple videocassette and indeed become somewhat of an icon for home video usage the world over. The second major player in the videotape format wars of 70s and 80s, the Betamax type of videocassette was developed by Sony and was formally released to consumers in 1975. Similar in design to JVC’s VHS cassettetapes, the Betamax was sadly destined for failure and would eventually lose the format wars and become obsolete (although still used by purists or certain specialized occasions). Taking its name from a portmanteau of the Japanese word for the way the signals were recorded and the Greek letter it resembled upon the tape being run (beta), combined with the –max suffix to suggest greatness (a sad piece of irony there), Betamax was fighting a losing battle a mere two years after its release, having about half the recording time of the VHS tapes being released in competition. Although for argument’s sake, it must be said that Betamax was a slightly smaller format than VHS, so there were some advantages. Essentially it came down to the fact that Betamax couldn’t keep up with the advancements that VHS was experiencing, namely being in the recording side of things. Betamax-based video recorders wound up being record-only, playback would – for technological reasons – only be available on full-size home VCRs, a bothersome chore that consumers would not put up with for long, especially in light of VHS-based recorders supporting full playback and copying capabilities. Poor Betamax. With its 30-60 minute-per-side capabilities, the laserdisc was a far cry from the massive storage capabilities of DVD and Blu-ray that we enjoy today. Developed in part by Philips, MCA, and Pioneer, the laserdisc saw a brief existence in the late 70s and early 80s, with very minimal usage seeing it last until around 2000. The format itself was – rather interestingly – fully capable of offering a higher quality of home video/audio than its counterparts of the era, yet was received rather negatively in most home video-viewing countries. America and Europe wanted nothing to do with the laserdisc, yet Japan and parts of South East Asia seemed to get along with the laserdisc fairly well. Near the end of the laserdisc’s career as a viable format, 2% of US households had a laserdisc player, which is significantly less than the 10% of Japanese household stocking the format. Laserdiscs were subsequently completely replaced by the more widely-accepted DVD format in the early 2000s. However, it would not be entirely true to say that the format was now obsolete, as laserdiscs still have a prominent place in the hearts of collectors (particularly in Japan, where the format was relatively better received) and even sees relative amounts of use in certain circles. *Please note: Some months may be missing due to a server crash.